In the early 1970s, a small and largely unknown city called Pucallpa, nestled in the heart of the Amazon jungle on the far side of the Peruvian Andes, was the birthplace of a genre of music that would become a regional phenomenon and a white whale for Latin music collectors many years later. A mid-century oil boom brought workers to the region to toil daily in the oppressive equatorial heat. With hard living so often comes brilliant music, the kind that can only be created by people needing an exceptional release from the hard work and drudgery of the day. It’s these conditions that brought Juaneco y su Combo together in the 1960s, creating a new sound known as jungle cumbia, a genre that now holds near-mythical status for fans of South American music, made all the more legendary by the tragic 1977 airplane crash that killed more than half of the band. Juaneco y su Combo’s first records were laid down for the Lima-based IMSA label in 1970 and 1972, and it is these early recordings, never before released internationally and virtually forgotten, that make up The Birth of Jungle Cumbia, to be released on December 10, 2013 by The Vital Record. Juaneco y su Combo started out as a standard good-time dance band, led by Juan Wong Paredes, known as Juaneco. Called Juaneco y su Conjunto in those days, they made their name playing waltzes and polkas and rumbas for fairs and weddings in the Pucallpa region. In 1965, Juan Wong Popolizio, the son of Juan Wong Paredes, who shared his father’s nickname, returned from his mandatory military service in the capital with the notion to electrify the band’s music. Taking over as bandleader, Juaneco Jr. brought the band’s simple dance party sounds into the emerging zeitgeist: driving electric guitars instead of folk strings, and a honking Farfisa organ instead of an accordion. He also brought in Noé Fachín Mori on lead guitar. Fachín, who came out of the criollo music tradition, was known locally as el brujo (the witch doctor). His gift for driving melodic hooks defined and solidified the band’s wailing, psychedelic sound, and he composed many of the group’s numbers. 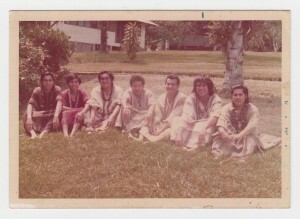 Identifying comfortably with their indigenous neighbors in Pucallpa, a progressive-bordering- on-revolutionary outlook for the time and place, Juaneco y su Combo appeared in traditional dress on stage and in photos, and further incorporated both the sounds and the lore of the inner jungle in their music. Their earliest IMSA recordings are loose, rangy, sensual, and untamed, and it’s these sounds that caught on so fervently in the region; a micro-regional answer to the rock-and-roll that was sweeping the world, but one that, by design or by chance, happened to sound fresher and more raw than almost anything else being produced on the planet. The raw emotion and unabashedly down-and-dirty qualities of these records more than make up for whatever production values they lack. Indeed, listening to later recordings of the same group, one has to wonder if a producer’s presence didn’t overly bridle their sound. The recordings that make up The Birth of Jungle Cumbia are taken from exceptionally rare vinyl copies, as the masters were long ago lost or taped over. Minor audio flaws are entirely eclipsed by the glorious passion and effervescence of the songs themselves. “Lamento en la Selva” provides a frightening, tragic bit of foreshadowing. This mostly lyricless song was written as a lament for the lives lost in the famous 1971 commercial plane crash that killed 92 people en route to Pucallpa (and later, because of the astonishing story of the sole survivor, became the subject of the Werner Herzog documentary Wings of Hope). Juaneco Jr.’s sister and brother were both lost in that crash. That tragedy would not be the only airline disaster to strike the Pucallpans, though. In 1977, on the way home from a gig, an airplane containing 5 of the 9 band members, including musical visionary Noé Fachín, crashed. It killed everyone on board. Remaining band members did regroup and continue playing, but without Fachín in particular, the sound was never the same.